DeMarcus Cousins has been assigned to the Golden State Warriors' G League team as he continues his comeback from an Achilles injury. 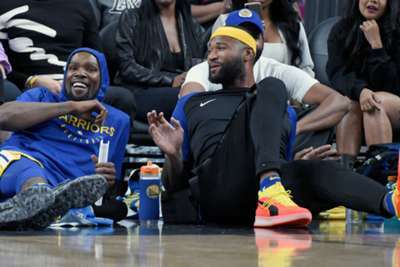 The back-to-back NBA champions announced on Monday the center - a four-time All-Star - will work with the Santa Cruz Warriors, though it is not clear how long he will remain with them. Cousins has not played since suffering a torn left Achilles in January while with the New Orleans Pelicans. The eight-year veteran was unable to land a long-term contract in free agency while he was on the road to recovery, so instead signed a one-year deal with the Warriors on July 6. In eight seasons in the league, Cousins has averaged 21.5 points, 11.0 rebounds, 3.2 assists, 1.4 steals and 1.2 blocks per game. Draymond Green - who is set to make his comeback from a toe sprain against the Minnesota Timberwolves on Monday - insists Cousins will fit in with Golden State's star-studded roster once he is back in action. "DeMarcus is one of the greatest talents in this league, so we're not going to play at some pace that he can't play at and make him irrelevant to our offense," Green said after Sunday's practice session. "You know we're going to make it work and do what we got to do to get the best out of everybody on this team."